O God, who in the abasement of your Son have raised up a fallen world, fill your faithful with holy joy, for on those you have rescued from slavery to sin you bestow eternal gladness. Through our Lord Jesus Christ, your Son, who lives and reigns with you in the unity of the Holy Spirit, one God, for ever and ever.r. According to the 1962 Missal of St. John XXIII for the Extraordinary Form of the Roman Rite, today is the feast of the Seven Brothers and Sts. Rufina and Secunda. 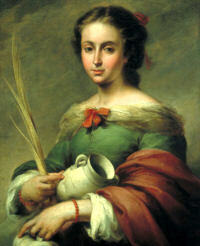 The Roman widow Felicitas and her seven sons were martyred in about the year 162. Pope Gregory the Great said of this widow, "She was more than a martyr, for seeing her seven children martyred before her eyes, she was in some sort a martyr in each of them." 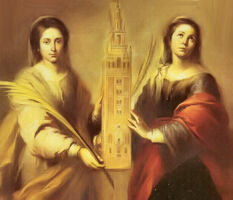 A century later, Rufina and Secunda, daughters of a wealthy Roman, refused to marry two suitors who had apostatized from the Christian religion. They were scourged and beheaded. During the persecution decreed by Emperor Marcus Aurelius (161-168), seven brothers, sons of the saintly Felicitas, were tempted to renounce their Christian faith; the prefect Publius first used flattery, then resorted to atrocious torments. But they remained steadfast, and their mother encouraged them in confessing Christ. Different types of death were allotted them. Januarius died under the scourge; Felix and Philip were beaten with clubs; Silanus was cast from a rock; Alexander, Vitalis and Martial were beheaded. Four months later their mother, too, suffered martyrdom. Burial took place in different cemeteries. During the eighth century Silanus and his mother were taken to the Church of St. Susanna at Rome, where they still rest. Alexander came into the possession of the abbey church of Farfa. Rufina and Secunda were sisters and virgins of Rome. Their parents had betrothed them to Armentarius and Verinus, but they refused to marry, saying that they had consecrated their virginity to Jesus Christ. They were, therefore, apprehended during the reign of the Emperors Valerian and Gallienus. When Junius, the prefect, saw he could not shake their resolution either by promises or by threats, he first ordered Rufina to be beaten with rods. While she was being scourged, Secunda thus addressed the judge: "Why do you treat my sister thus honorably, but me dishonorably? Order us both to be scourged, since we both confess Christ to be God." Enraged by these words, the judge ordered them both to be cast into a dark and fetid dungeon; immediately a bright light and a most sweet odor filled the prison. They were then shut up in a bath, the floor of which was made red-hot; but from this also they emerged unhurt. Next they were thrown into the Tiber with stones laid to their necks, but an angel saved them from the water, and they were finally beheaded ten miles out of the city on the Aurelian Way. Their bodies were buried by a matron named Plautilla, on her estate, and were afterwards translated into Rome, where they now repose in the Basilica of Constantine near the baptistery. Symbols: Broken images or pottery.